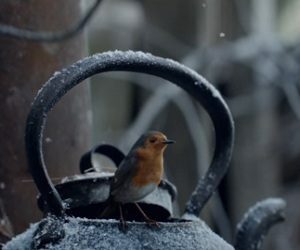 The British supermarket chain Waitrose has released a heart-melting Christmas ad, with a tiny fully computer-generated robin in the main role, that travels through the night in deadly conditions to arrive in time at home, in the UK, for Christmas morning. The 90-second spot, titled “Coming Home”, features the courageous bird flying across mountains and seas to get back to Britain, where a young girl waits for him with a mince pie on a special table. Rain, powerful winds, snow storms and hungry animals attacking him do not stop him from continuing his journey home, to enjoy the festive treat together with another robin friend. Arrived at the Christmas table set out for him, the protagonist lets the little girl he is there, saying “thank you”, most probably, and then starts eating with the other robin. Happy to see that he has made it, the girl sits at the table with her family and enjoys the Christmas lunch. The advert ends with the onscreen line “At Christmas, there’s nothing quite like Waitrose” and with the hashtag #HomeForChristmas.